After getting a rap from state Urban Development Minister Pritam Singh Panwar, the Mussoorie Dehradun Development Authority (MDDA) has finally woken up to look after the much-neglected Hemwati Nandan Bahuguna (HNB) shopping complex at Clock Tower. In the Pushpa Saklani murder case, the district courts have accepted the plea of the husband of the deceased and ordered re-investigation of the case by the CBI. The police launched an anti-encroachment at BHEL township here today. 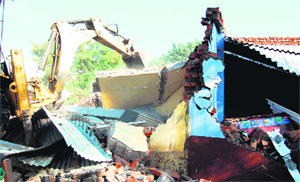 The team led by SHO Mahendra Singh Negi, Municipal Corporation and Property Department — BHEL officials demolished illegal constructions. Officials said encroachers had been warned by way of a notice a fortnight ago. The state government has directed six sugar mills to comply with pollution control norms. Addressing a press conference in Dehradun today, Ranbir Singh, Principal Secretary, Forests and chairman of the Uttarakhand Environment Protection and Pollution Control Board (UEPPCB), said the government would take strict action against sugar mills that did not comply with pollution control norms. The district administration will hold “Tehsil Diwas” twice a month for the public to lodge their grievances with officials concerned. The main aim to organise the day is to help people avoid inconvenience and have an easy access to the officials. Dehradun, November 18 Sealing of an engineering college being constructed by Himalayan Institute Hospital Trust at Jolly Grant has been ordered by MDDA. Residents of Ranikhet in Almora district have again started demanding the district status for the subdivision. They are stating that due to non-grant of the district status to the area, subdivisions of Tarikher, Dwarahat, Bhikiasain, Salt and Chaukhutia, besides Ranikhet of Almora district, are lagging in development and villages around them are not getting sufficient attention from officials. Revered spiritual guru Shankaracharya Raj Rajeshwaram Maharaj has termed marma medical science as ancient. He said it had no side effects and could be beneficial to patients across the world. Agitating employees of Uttarakhand Purva Sainik Nigam Limited (UPNL) held a protest in support of their demands at the Raipur bus stand here today. A day after the Central government granted the Z category security to yoga guru Ramdev, he along with his associate Acharya Balkrishan, met BJP national president Amit Shah in New Delhi today. The Bahujan Samaj Party (BSP) has decided to work to regain its lost base in the Haridwar constituency where it suffered a humiliating defeat in the Lok Sabha election held recently. It started a new membership drive in every ward of the district in the initial stage yesterday. It started from the ward number-2. The opportunity to perform in the inauguration function of the Under-17 National School Volleyball Tournament turned out to be a big let-down for hundreds of schoolchildren. The schoolchildren from across the state were called to perform during the opening ceremony of the volleyball tournament, which kicked off at Pavilion Ground in Dehradun today. Speakers dwelt on the life and contributions of Bharat Ratna GB Pant at the 55th foundation day function of GB University at Pantnagar yesterday. The Bharat Ratna Pt Govind Ballabh Pant Memorial Lecture was organised at the conference hall of the College of Basic Sciences and Humanities (CBSH). Tourists thronging the world famous Rajaji National Park will soon have a new tourist circuit, which will offer more variety of wildlife, flora and fauna and adventure. Members of the Uttarakhand Urja Kamgar Sangathan (UUKS) have decided to apprise directors of the problems the staff could face at the upcoming proposed meeting of board of directors of Uttarakhand Jal Vidyut Nigam Limited on November 26. Atul Shrikunj, spokesman for the Uttarakhand Congress, has condemned the behaviour of BJP legislator Rajkumar Thukral during a programme of Chief Minister Harish Rawat to inaugurate Rudarpur tehsil in Udham Singh Nagar district yesterday. Thukral created a ruckus on the dais and clashed with former Congress legislator Tilak Raj Behad. Atul alleged that the BJP was perturbed at a series of development works initiated by the Congress-led government in Uttarakhand. The three-day founder’s day celebrations ‘Utsav-2014’ of the Sardar Bhagwan Singh Post Graduate Institute of Biomedical Sciences and Research (SBSPGI) concluded here today. 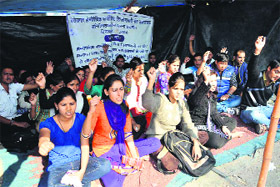 Agitating yoga diploma holders have decided to continue with their protest and indefinite fast in support of their demand for appointment as yoga teachers in government schools. State Forest Minister Dinesh Agarwal said the state government was working for the welfare of Forest Department employees. Unison World School along with Spicmacay organised an Indian vocal recital by Mishra Bandhu, Pt Ritesh Mishra and Rajnish Mishra, here today. Agitating allopathy diploma pharmacists today demanded that the state government take effective steps to appoint unemployed allopathy pharmacists in sub-centres and health centres across the state. They said pharmacists were providing the best medical and health care facilities to villagers in the absence of medical officers in mountainous areas of the state. Agitating unemployed homoeopathy pharmacists held a protest here today in support of their year-long pending demands. The pharmacists under the banner of the Uttarakhand Unemployed Homeopathy Pharmacists gathered here and raised slogans against the government. The Uttarakhand boys win the inaugural match of the Under-17 National School Volleyball Tournament here today. Seven matches were played in the boys’ category on the first day of the tournament. Carman School has entered the finals of the ongoing DDCSA Senior Cricket Tournament after defeating Aryan School by 14 runs in the second semifinal played at St Joseph’s Academy here today. The hosts St Joseph’s Academy have already secured a berth in the finals. They won the first semifinal on Monday. The minister, who made a surprise check of the complex constructed by the MDDA last night, found several anomalies, including open electricity wires, filth, dirty washrooms and illegal occupants. The HNB shopping complex, a major project under the MDDA, was opened almost three years ago, to relocate the shopkeepers uprooted from the Chakrata Road in the first phase of the road widening plan implemented by the MDDA. 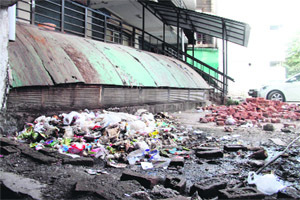 Almost 250 shopkeepers were given the shops out of which only 30 have started operating from the complex. The rest of the shopkeepers have either given the allotted shops on rent or using them as godown for storing the goods, while they continue to run their business from original shop on Chakrata road. Ever since the complex was opened it led to altercations between shopkeepers and the MDDA authorities over the facilities being extended to the former. In the past too, the MDDA had maintained that the shopkeepers were responsible for the maintenance and upkeep of the complex leading to discontent amongst the businessmen. “The live electric wires that were lying in the open would be made underground to avoid any major accident. To ensure that migrant labourers, beggers and homeless do not stay in the complex, a watchman would be appointed to man the complex round the clock. All these arrangements are being made for the two floors which are operational at the moment. Meanwhile, we would also be closing the staircase leading the upper floors so that they are not misused,” he added. Hailing the decision, the MDDA Shopkeepers Society said it was indeed a positive move for the betterment of the shopkeepers, who relocated in this complex. We had been requesting for maintenance of the complex for a long time, but nothing was done by the MDDA,” said a shopkeeper. While hearing the plea of OP Saklani, senior advocate and Pushpa’s husband, the district court ordered the CBI to re-investigate the role of Shameem Alam Khan, whom it had given the clean chit ealier. OP Saklani was not satisfied with the CBI investigation in the case and moved the district courts for re-investigation of the role of accused Shameem Alam Khan in the murder of Pushpa Saklani, who was brutally murdered on October 16, 2012 inside OP Saklani’s house at Park Road. The police claimed in their investigation that the murder was committed with an intention to loot. The husband refuted the police theory and moved the High Court in 2012, claiming that Shameem Alam Khan killed his wife and the police did not investigate the matter appropriately. Consequently, the High Court ordered a CBI probe in the case. The CBI, in its investigation, gave the clean chit to Shameem Alam Khan. Prior to this drive, this morning too, the encroachers had been warned, it was stated. When illegal occupants neither left by themselves nor destroyed the encroachments, JCB machines were put on the job by the team. Several encroachers had even built cemented houses and shops on the BHEL land near Ranipur. The Property Department of BHEL has warned illegal dwellers to evacuate the land after there were several complaints of increasing encroachment at several places falling under the BHEL campus area. This is the first major drive carried out by BHEL this year. It has set off panic among the illegal dwellers, with many themselves evacuating the BHEL campus, fearing crackdown. Many occupants urged the anti-encroachment cell to stop the drive for a fortnight or so, but the team members said they had been given enough time. They cited the higher authority’s orders in this regard. As soon as the news spread, political leaders too arrived at the spot. In the view of heavy deployment of police personnel and stern attitude of the officials, they either left the spot or remained mute spectators. SHO MS Negi said the drive will be further carried out in the vicinity and strict legal action will be taken if there are attempts at encroachment again. He said Chief Secretary N Ravishankar had chaired a review meeting, following which, he had directed strict action against industries found violating pollution control norms. He said as many as 73 industries fall under pollution categories, that mainly include sugar mills and distilleries. He pointed out that at present, six sugar mills, that include five in Udham Singh Nagar district and one at Doiwala in Dehradun district, are not complying with pollution control norms. He said some of these sugar mills have sewage treatment plants, but these are not operational. Vinod Singhal from Uttarakhand Environment Protection and Pollution Control Board was also present. 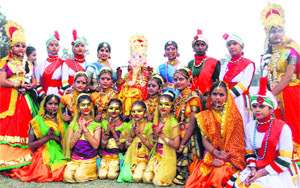 District Magistrate Chandresh Kumar said the diwas would be held on the first and third Tuesday every month. Sealing of an engineering college being constructed by Himalayan Institute Hospital Trust at Jolly Grant has been ordered by MDDA. According to organisers of the Ranikhet Zila Banao Sangharsh Samiti, the area, that was once a link between Terai and border districts of Almora and Pithoragarh and on the Char Dham Yatra route, a training centre of Kumaon regiment and its museum have been ignored after Independence. “Despite housing the first departmental store, post office, treasury and Army Cantonment before Independence, Ranikhet was not given its due despite the people having been struggling for district status for the last 29 years,” said Deep Singh Bora, a journalist based in Ranikhet. Residents said Ranikhet would be rid of Cantonment laws if it succeeds in getting the district status and the possibility of a civic body such as Nagar Palika in the town of Ranikhet would be strong. That would make better facilities of water, education, health and road network possible. “Besides development of the town of Ranikhet, all five subdivisions of Bhikiasain, Salt, Dwarahat, Tarikhet and Chaukhutia will get a boost in development activities, which are less at present owing to the distance from the district headquarters at Almora,” said Jay Prakash Shah, a senior citizen and businessman in the town. Lt Gen (retd) Mohan Bhandari, who is also a resident of Ranikhet town, said if the sub-divisional town earlier habituated by the British gets a separate district status, it would help develop the hilly areas in Kumaon. “This would boost economic activities, which have taken a backseat due to ineffective planning,” said Bhandari. Ranikhet residents said after a committee was constituted for separate district status for the sub-division in 1885, they expected district status for Ranikhet when districts of US Nagar, Bageshwar and Champawat were created in 1997, when their hopes were shattered under Mayawati’s rule in UP. The residents were again disappointed after a separate state of Uttarakhand was formed. “Several committees and commissions such as revenue commission of Uttar Pradesh in 1987 and the eighth Finance Commission in 1989 recommended separate district status for Ranikhet. The present state government is dragging its feet on the matter, provoking unrest in the sub-division,” said Gusain Ram, a resident of Jaruri Bazaar in Ranikhet town. The saint inaugurated the closing session of the four-day long training programme on International Marma Science and Marma Therapy at Prem Nagar ashram auditorium here today. Marma medical science exponent Dr Sunil Joshi said such training programmes were a platform to young medical students to learn and know the intricacies of the ancient science of marma chikitsa. “We have treated such patients who were not cured by allopathic, ayurvedic or other practices,” said Dr Sunil Joshi, who has been running free marma camps in and outside the country. Mauritius Veda expert Dr Vishnu Dutt Rakesh said in today’s era, the commitment and work being done by Dr Sunil Joshi in spread of the Marma science would be regarded as a major social-medical world. Religious gurus, academicians also attended the convention pointing to the healing touch (marma) that this therapy brings in curing diseases without having any side-effects. Mahavir Aggarwal of Uttaranchal Sanskrit Academy lauded the efforts of marma experts who were providing medical treatment at almost no cost and have cured even those people, who despite shedding lakhs in allopathic did not recover from the ailment fully. Ayurveda Director Arun Tripathi, Ayurvedic College Principal Gyanendra Pandey, Head of Yoga Department of Gurukul Kangri University Dr Ishwar Bhardwaj, Yogesh Pandey of Rishikul-Malviya Society, Dinesh, Mayank Joshi and students of Gurukul Rishikul Ayurvedic Medical College took part in the four-day training programme. The protesters said they would continue with their agitation till the state government take effective steps to fulfil their demands. 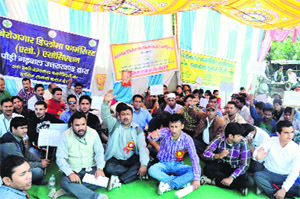 Addressing the protesters, Bhawesh Jagudi, state president of the Uttarakhand Purva Sainik Nigam Limited Employees Association, said extension of the tenure of employees working under the Panchayati Raj through Uttarakhand Purva Sainik Nigam Limited, revision of pay scales and better perks figure among the demands. Mahesh Bhatt, Kushalpal Singh, Mahesh Bhatt, Anil, Amit Bahuguna, Rahul Singh, Ashudeep Sajjwan and others were present. Balkrishan said Ramdev and Shah discussed various issues related to development, particularly giving shape to the Prime Minister Narendra Modi’s skill development programme. He added the Patanjali Yogpeeth appreciated the Prime Minister’s move to urge different countries to celebrate International Yoga Day, which would get yoga global acceptance and reach. Balkrishan said Ramdev also met Union Minister for Micro, Small, and Medium Enterprises Kal Raj Mishra, Union Minister of State Giri Raj Singh and discussed ways how to make youths of the country technically skilled and morally upright. Nathu Singh, state party in charge, said the drive was started on the directives of party national president Mayawati. “We want to induct new members in the party before 2017 the Assembly election,” said Nathu Singh. The party workers being enrolled would be apprised about the Bahujan Samaj Party ideology, its founder leader Bhim Rao Ambedkar and Mayawati and a minimum token money of Rs 10 was being collected for party fund, he added. “We want to make a serious, dedicated cadre base and to counter Prime Minister Narendra Modi wave, we have to strengthen ourselves,” said Nathu Singh. Local leader Nepal Singh said more than 20 people had been given membership of the party. Krishna Dhiman, Ram Naresh, Rupesh Khanna, Rohit Rai, Manoj Dhiman, RP Singh, Daya Ram, Naresh Chandra, Rajendra Deol, Chandra Bhan, Raj Kumar, Amit Kumar, Sunil Kumar, Sushil Kumar and others also took part in the membership drive. Terming the membership drive as formality, Samajwadi Party youth leader Sonal Prince said the Bahujan Samaj Party had lost its ground not only in Uttar Pradesh and Uttarakhand but also in other states. However, they did not get an opportunity to perform and many of them had to miss their lunch, thanks to Chief Minister Harish Rawat, who did not turn up on time. Moreover, there was no proper arrangement of lunch for the students. One of the anxious students from Guru Nanak Inter College, Rudarpur, said, “We did have lunch and are still waiting for our turn to perform.” A few students also complained of lack of drinking water facilities at Pavilion Ground. Notably, the CM was expected to arrive at the venue at 12 noon but his arrival was postponed a number of times and he finally arrived at 5:30 pm. In the meantime, a few students had their lunch at the nearby gurdwara where they were staying. Prof RC Pant, former Vice-Chancellor of Kumaon University, delivered the lecture. 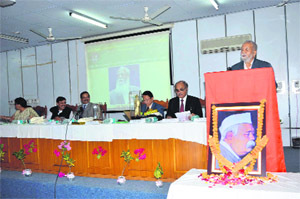 Prof HS Dhami, Vice-Chancellor of Pant University, presided over the function. 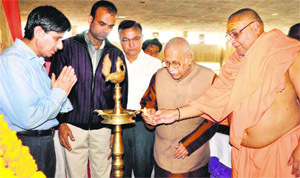 Dr BS Bisht, former Vice-Chancellor of Pant University, was the guest of honour. The dais was shared by Rajesh Shukla, MLA and member of the Board of Management of the university, Dr J Kumar, Registrar and Dean, Agriculture, Dr Uma Melkania, Dean, CBSH, and Dr Vir Singh, Director, Communication. Dr RC Pant briefed about the life of Pt Govind Ballabh Pant. He said Pt Pant performed a journey from an average student to a topper. He said Pant started his social life by establishing Kumaon Parishad and eradicated kulli begar tradition from Kumaon and worked for women education. He said Pant started his political career by joining as a member of the Swarajya Party on January 1, 1923, and contributed in the freedom struggle of India and later in the development of the nation. “He was a great personality in the Indian politics and was a genius in fields of finance, agriculture and forestry. Keeping in view the contribution of Pt Pant in the establishment of Pant University, the name of this university was rechristened from Uttar Pradesh Agriculture University to GB Pant University of Agriculture and Technology,” he added. Prof HS Dhami said Pant was not just a name, but signified a glory chapter of the Indian political history. Earlier, Dr Uma Melkania welcomed the guests and Dr J Kumar proposed a vote of thanks. A traditional folk dance, Chholia, was presented by kumaoni dancers. 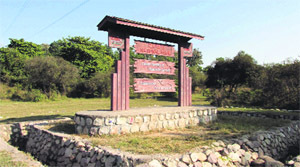 The circuit starts from Ranipur till Beriwada in the Haridwar forest range of the park. Till date only 10 km gypsy track is allowed to tourists. This track will be further increased by 17 km. A patrolling track was erected for park security personnel to carry out vigil from Beriwada-Halzora till Sureshwari Devi temple in Ranipur a decade ago. As per the proposal this track will be opened for common tourists too. NB Sharma, Wildlife Warden, said from Beriwada till Sureshwari Devi temple, the Ranipur track circuit was proposed for which budget allocation had been sought. “As soon as the budget is sanctioned, work on the project will begin on this track,” he said. Meanwhile, the Chilla range falling in Pauri Garhwal is witnessing huge rush of tourists in comparison to last year. DP Uniyal, ranger, said tourists from foreign countries were also arriving in large numbers to have wildlife safari. He said signage’s depicting kilometers had been erected within the track with wireless sets being provided to the first and last gypsy of tourists for security purpose. While chairing a meeting of office-bearers, sangathan president Rakesh Sharma said a memorandum highlighting their pending demands would be submitted to the Board of Directors. He said the UJVNL should take effective steps to fill the vacant posts of directors and steps must be taken to stop sanctioning of non-functional grade allowance to the staff. Sharma said the increase in pay and perks of assistant technical grade employees, giving bonus to staff, sanctioning of posts of executive directors were a few pending demands. He said the Chief Minister had laid the foundation stones of various development works in the state. The government had taken various steps to revive tourism in the state, he added. Atul said around four lakh pilgrims undertook the Char Dham Yatra though the shrine areas had faced the brunt the natural calamity last year. The concluding day witnessed a sparkling display and presentation of “Saptrang” which comprised of rangoli, face painting, card making, mehndi, photography, flower decoration, collage and other competitions. “Saptrang” was inaugurated by Harinder Pal Kaur, wife of the founder director of the institute. Meanwhile, Neha Chand and Neelam Chand were adjudged winners in the rangoli competition while Shefali Bhardwaj won the card-making competition. In the painting competition, Vicky Sharma was adjudged the winner while Pragati, Rupa and Prachi won the mehndi competition. SBSPGI managing secretary Dr Gaurav Deep Singh and Brig PPS Pahwa (retd), additional director (administration), gave away prizes to the winners. Yoga Diploma Holders Association president Vijaypal Singh said they would continue with their protest until our demands were met by the government. He said in February, the government announced of creating 10,000 jobs for yoga diploma holders, B Ed trained, TET trained and Siksha Mitra, but no action has been taken from the government to fulfill its promise. The protesters said a number of universities in the state were running degree and diploma courses in yoga and there were about 22,000 yoga diploma and degree holders in the state. Their primary demands include initiating the recruitment process of yoga teachers and making yoga syllabus mandatory at the primary level in the state government schools. Addressing the inaugural session of Uttarakhand Forest Development Corporation here today, the minister said employees too need to work with dedication and sincerity. He said Uttarakhand Forest Development Corporation was an important source of revenue earner and efforts were needed to ensure that revenue was increased substantially. Newly appointed chairman of Uttarakhand Forest Development Corporation, Harish Dhami was handed over a memorandum by the employees. Girish Naithani, Sunil Pundir, Arya Tripathy, Jagdish Joshi and Om Prakash were prominent speakers at the convention. The brothers have been learning music since birth with the sounds of tanpura, sarangi, tabla and voices of their forefathers echoing in their home and surroundings. The performance of the duo brothers has touched listeners’ hearts worldwide. They have sung 3rd track “Mahadeva” in the album called ‘Rise’ that has been nominated for the prestigious ‘Grammy Awards’. They are ‘A’ grade vocalists of the All India Radio and Television. They have been awarded the prestigious Yuva Ratna Award, Sangeet Natak Akademi’s Ustad Bismillah Khan Award, Sangeet Samriddhi Samman etc. The divine raga by the young maestros kept the students connected with the artistes. ‘Mishra Bandhu’ were accompanied by Chitrang Pant on tabla and Shekhar Ganeshan on harmonium. An interactive session between students and artistes was immensely knowledgeable. Agitating allopathy diploma pharmacists today demanded that the state government take effective steps to appoint unemployed allopathy pharmacists in sub-centres and health centres across the state. They said pharmacists were providing the best medical and health care facilities to villagers in the absence of medical officers in mountainous areas of the state. The jobless agitating allopathy pharmacists gathered at Raipur bus stand here today. They lamented that a memorandum had been submitted to officials many times after holding of a protest in front of the Secretariat campus, but the state government was yet to take steps to accede to their demands. Expressing his views, Manoj Tripathi, state president of Uttarakhand Allopathy Diploma Pharmacists Association has said the association members have decided to be continue with their protest till the state government fulfils their demands. Priyanka, Mahipal Negi, Sushil Nath, Roshan Kala, Ashish Nautiyal, Krishna Dabral, Pradeep Kandpal, Vandana Goswani and Shanti were among those present. Agitating unemployed homoeopathy pharmacists held a protest here today in support of their year-long pending demands. The pharmacists under the banner of the Uttarakhand Unemployed Homeopathy Pharmacists gathered here and raised slogans against the government. They said though they had submitted memorandums of demands to the officials concerned several times nothing had been done so far. They are demanding that 70 posts of homoeopathy pharmacist in health centres be filled, and service rules. Pravesh Uniyal, Rajmohan Negi, Kailash Chamola, Sharavan, Pramod Semwal, Digpal, and Pankaj took part in the protest. The host Uttarakhand boy’s team defeated Vidhya Bharti in straight sets by 25-11 and 25-14 points. Andhra Pradesh won its match against Gujarat in a three set match by 25-20, 23-25 and 25-13. Tamil Nadu defeated Orissa by 25-23 and 25-15 in another match, while Jharkhand defeated Lakshadweep by 25-15 and 25-13 points. In another match in boy’s category, Uttar Pradesh defeated Telangana by 25-15 and 25-12 points. Haryana registered a comfortable win over Punjab by 25-18 and 25-12 points. In the girl’s category, Karnataka defeated Telangana by 25-11 and 25-16 points in the first match, whereas Haryana defeated Tamil Nadu in three sets match by 25-22, 23-25 and 25-22 points. Andhra Pradesh won its match against Jharkhand by 19-25, 25-23 and 25-22 points. In another match, Kerala defeated Rajasthan by 25-13 and 25-16 points. However, Uttarakhand girl’s team lost its match against Maharasthra by 25-6 and 25-17 points. After losing the toss and being put into bat first, Carman School put up a robust batting display and scored 139 runs for the loss of 7 wickets in 20 overs. Divyanshu scored 41 runs while Harsh contributed 20 runs. For Aryan School, Aman, Pradyum, Anurag, Parth and Sagar took 1 wicket each. The Aryan School innings got off to a dismal start, with the opening order failing to put up a semblance of a fight. In the middle overs, Manvender contributed 24 runs while Braham scored 14 runs. The team was bowled out for 125 runs. For Carman School, Manish and Saurav scalped 2 wickets each while Sanjay and Mayank took 1 wicket apiece. The Uttarakhand boys and girls basketball teams will participate in the 41st Sub-Junior National Basketball Championship being organised by the Maharashtra State Basketball Association under the aegis of the Basketball Federation of India (BFI) at Nashik from November 22 to 28. A 15-day pre-national coaching camp was conducted by the Uttarakhand Basketball Association in Dehradun. The boys’ camp was conducted in The Doon School by Balwinder Singh, NIS, basketball coach, and Durgesh Bhatia, while the girls’ camp was conducted in Welham Girls’ School by Vinod Vachani, NIS basketball coach.